Feeding forage to calves has been the subject of much debate over the years, in part because even though we know that fermentation of grain is essential for rumen development, sometimes in research and on farms calves fed hay have shown improved performance. If we focus on the rumen environment rather than the specific feeds we are providing, we can start to make sense of both the calf's requirements and ways we can meet her needs. Research in the 1950s showed that volatile fatty acids (VFA) produced from the fermentation of starch stimulated rumen development more than the VFA resulting from forage fermentation, and feed programs for young calves began to focus on milk and grain and exclude forage. But on farms and in research studies the effect of feeding forage to calves is not consistent - sometimes calves fed forage perform better than those without it. Looking at calf performance through a different lens may shed new light on this question. 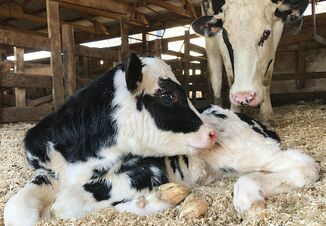 Just like cows, calves can experience ruminal acidosis, and just like for cows, forages may play a role in helping calves overcome this challenge. Rumen development requires a source of fermentable carbohydrate, so good quality calf starters typically contain a high concentration of starch. However, calves tend to eat big meals in proportion to their body and rumen size, and high starch levels in starter can lead to acidosis. The form of the starter also influences the risk of acidosis. Grains need to be finely ground to form a good quality pellet, but this reduction of particle size makes the starch more rapidly available in the rumen. Heat and moisture used in the pelleting process also make starch more fermentable. A textured starter containing whole or minimally processed grains and a supplemental pellet does not prevent calves from eating large amounts of starch at once, but the starch in coarse grains will be available only after calves chew and break down the grain, which often happens as they ruminate several hours after eating. As a result, calves eating textured starter will have lower risk for acidosis than calves fed a pelleted diet. When the starter is a cause of acidosis, adding forage to the diet will help buffer the rumen. In some cases, particularly older calves who are eating more starter, feeding forage improves starter consumption. We tend to generalize forages for calves, but forage physical form and nutritional quality affect intakes of both starter and forage. Calves seem to eat chopped hay more consistently than long hay and will sometimes prefer highly palatable hay over starter. Consumption of low quality chopped hay tends to be quite consistent, and in 3 independent studies intake of chopped straw was about 4% of calves' total dry feed intake. In some cases bedding can supply this small amount of straw, so type and frequency of bedding may also influence the time at which calves need to be offered forage. When designing a calf feeding program, we need to balance the risk of acidosis with adequate grain intake to stimulate rumen development and ensure a smooth transition at weaning. If we feed too much forage too early, calves may not consume enough energy, because forage is less energy dense per unit than grain and the complex, structural carbohydrates in forages are digested at a slower rate than starch in grain. Forage is also bulky and can quickly fill the limited space in a calf's digestive tract, sending the brain a signal to suppress appetite. In addition, as mentioned above, the VFA produced from forage fermentation do not stimulate rumen development, and forage intakes can be highly variable. Keratin buildup on the rapidly growing rumen papillae is another potential issue related to diet, as it has been suggested that it may reduce the absorptive capacity of rumen papillae and alter early rumen development. Either forage or textured starters with whole or partially processed grains have demonstrated that they can provide physical abrasiveness that helps to prevent the buildup of keratin. Using textured starters instead of forage to maintain a healthy rumen prior to weaning can be advantageous since textured starters won't reduce energy intake and slow down rumen development like forage does. 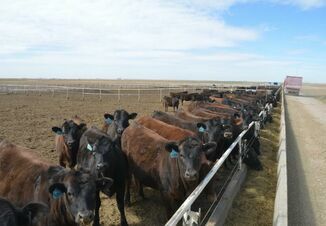 Starter ingredient composition, physical form, and intake level are important factors to consider when making a recommendation as to when forage should be fed, and these will change with different management practices. In the past it has been suggested that forage be fed to calves when starter consumption reaches 5 to 6 pounds per day, at around 7 to 8 weeks of age. This recommendation is appropriate for textured starter with coarsely processed or whole grains. However, when feeding a completely pelleted starter with high amounts of ruminally digestible starch, forage should be fed by 5 to 6 weeks of age to prevent acidosis. Lowering the starch concentration in the pellet could also prevent acidosis and the need to feed forage, but at the high price of reduced rumen development by weaning time. It is important to continue meeting calves' nutrient requirements after weaning to support growth. When calves stop receiving milk starter consumption increases rapidly, and good quality, high starch starters need to be supplemented with forage. The amount of forage to be added will depend on forage quality, starter composition, and the physical form of forage and starter. A good quality textured starter/grower will need to be supplemented with only 5 to 10% forage up to 16 weeks of age. The need for forage when feeding pelleted starters will depend on the starch and fiber level in the pellets. High fiber pellets will not require forage in the diet as the pellets effectively contain that forage, however pellets alone typically do not provide enough abrasiveness to prevent keratin buildup.